TAYABAS CITY - Parent involvement is considered a predictor of early literacy success and future academic achievement of students. Involving parents in the curriculum enhances children’s educational experience and provides way to develop a sense of belongingness. With this, Tayabas West Central School III shared the mission of engaging parents in the curriculum by supporting one of the Schools Division of Tayabas City’s flagship programs, “Basa ni Nanay, Basa ni Tatay , which is now on its 3rd year of implementation. “Engaging parents and children in mutual activities that include book reading may constitute the richest potential for supporting children’s early development,” said Christian Bables, Education Program Supervisor for Filipino. “ELLN teachers need to ensure that literacy curriculum is open to home-school partnership,” he added. As an outcome of the program, Jasmin Jastiva, a parent of a Grade 3 pupil from TWCS III agreed to tell a story inside the classroom on January 11. “At first, I was nervous but seeing children eagerly listening to me, I felt happy,” said Mrs. Jastiva. “As a parent, I have to realistically devote time and find an activity that will help the school reading program,” she added. 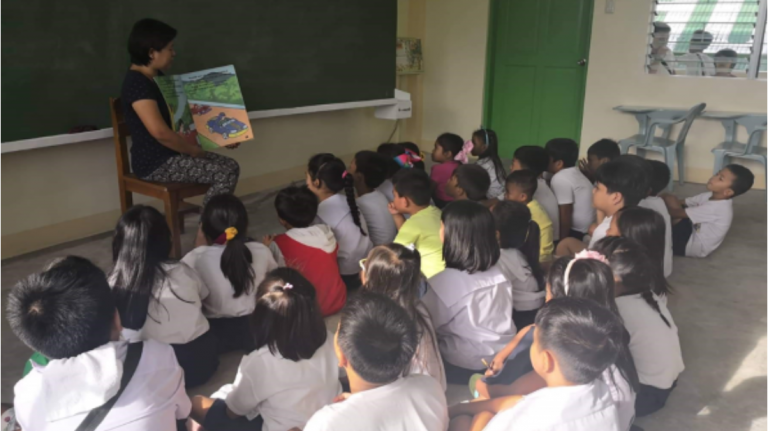 Aside from Basa ni Nanay, Basa ni Tatay, Tayabas West Central School III uses a group chat to involve parents in improving reading skills of their children while at home. This serves as an avenue for teachers to monitor their students reading activity at home.